What, exactly, is New York pizza? That’s a charged question in a town where pizza partisans—and that means everyone—love nothing more than arguing the merits of this crust, that cheese, or a sauce that’s seen livelier days. And there’s no easy answer. The sad truth, although it mostly goes unsaid, is that New York pizza isn’t what it used to be. The great dynastic names live on, some deservedly, some not, in the coal-fired collective memory, generating long, nostalgic lines and self-perpetuating word-of-mouth, even as inconsistency and clandestine changes in ownership leave an increasingly bad taste in the connoisseur’s mouth. Which is why, instead of just canonizing the old, we should gleefully welcome the estimable new. New York pizza has historically meant John’s, Patsy’s, Totonno’s, and Lombardi’s, and soon, we boldly decree, it will come to mean Franny’s, a newfangled Park Slope pizzeria where, even in its earliest days, the Underground Gourmet has glimpsed pizza greatness. It came on our third visit, when the crust, which early on was a tad dry, a bit brittle, and almost too thin, had settled into a tender, pliable, yet snappy groove, and the high-grade toppings coalesced. It was delicious, resilient, and light, Neapolitan in its simplicity and balance, and it came as a surprise: At Franny’s, a pizza isn’t just a pizza—it’s a political statement, the vehicle for expressing a worldview shared by husband-and-wife owners Andrew Feinberg and Francine Stephens, veterans of Savoy and as committed to the Chez Panissean tenets of local, sustainable agriculture as they are to the venerable tradition of artisanal pizza-making. Franny’s takes all its ingredients that seriously, from house-cured sausage to hormone-free farmhouse milk, and the details are micromanaged—presumably, judging by her tireless, all-seeing dining-room patrols, by Franny herself. Fine green olives marinating in olive oil and fennel seeds greet you at the sleek steel-and-polished-cement bar, where Orpheus, the bartender, expertly mixes house cocktails like Moscato d’Asti with fresh lime juice and Prosecco with grapefruit. The soundtrack is old-time jazz, the clientele young Park Slope parent. In local pizza-world parlance, Franny’s is Otto—Mario Batali’s sprawling enoteca and pizzeria—with two pastas and an oven. 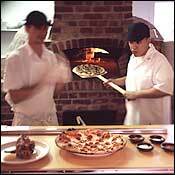 (Otto sticks to antipasti, meats and cheeses, and cooks its love-’em-or-hate-’em pies on a griddle.) The similarity extends to the seasonally minded selection of appetizers and the lack of full-fledged entrées, a format that encourages sharing. Crostini come, like everything else, in a daily changing rotation. Order one of each for $5: melted pecorino Toscano with subtle anchovy butter; crumbled egg with a tiny slab of tuna bottarga; and a delectable improvement on the unwieldy chickpea crostini that’s become an Italian-restaurant cliché, this one more or less held together by a pungent olive mortar. Feinberg has a deft touch with vegetables, like the simple, springy plate of crunchy shaved asparagus, dressed with fragrant olive oil and lemon and showered with Parmigiano-Reggiano. In a world of drab insalate tricolori, Franny’s house salad of escarole and red onions is a simple breath of fresh, parsley-strewn air. Crispy-leafed, tender-stalked fried artichokes do Rome’s Jewish ghetto proud. Primi portions of pasta reprise the seasonal theme as well as the Italian mantra of simplicity. One night it’s spaghetti with garlicky ramps and spring herbs, cooked a tad past al dente; another it’s spaghetti cacio e pepe, that splendid streamlined mixture of grated pecorino, black pepper, and olive oil. Ricotta gnocchi with stinging nettles conjures something out of Little Shop of Horrors; in fact, they’re quite harmless, lumpy green dumplings, smelling of spinach, impossibly light, and fairly drenched in butter and Parmigiano—an equally addictive cousin of Al di là’s Swiss-chard malfatti. All of this is prelude to the pizza, rough, rustic beauties perfumed with smoke, exquisitely charred, and served unsliced in the Neapolitan style. Franny’s makes much of its blazing wood-burning, brick-walled beehive oven, and with good reason: This is a crust-lover’s pie (at the expense, some might think, of the sauce, the cheese, and the toppings, which are applied with a minimalist touch), and the crust triumphs, even though Feinberg and crew must still be acclimating themselves to the dough and the fire. The pizza was different every time we had it, but always uncommonly tasty. A featherweight anchovy-and-caper pie was so thin on our first visit, it was almost see-through, the tomato sauce just barely painted on. Spicy artichokes with tomato and grated pecorino was a nifty combo, redolent of fresh mint. And as the crust continued to evolve, growing thicker and puffier around the edge, both the parsley pesto with ricotta and mozzarella and that memorable Maine meatball specimen approached pizza perfection. For dessert, the dense, cakey tirami su and milky anise panna cotta both surpassed the sandy-textured pistachio gelato. But the true New York pizza lover, if he has any appetite left, will appreciate his good fortune, count his blessings, and order another pie for the road. Pizza this good, this soon, doesn’t come along every day—and that’s something even the most contentious critics can agree on. Franny’s, 295 Flatbush Avenue, Park Slope, Brooklyn (718-230-0221). Dinner, 5:30 to 11 p.m. Tuesday through Thursday, 5:30 to 11:30 Friday and Saturday, 5:30 to 10 Sunday. Appetizers: $5 to $10. Pastas: $11 to $15. Pizzas: $9 to $14. MC and V.